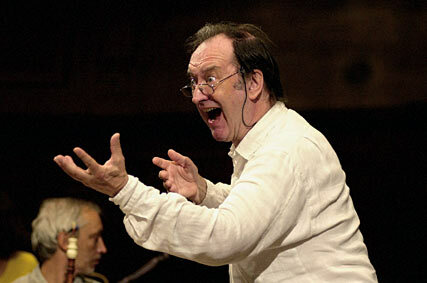 Nikolaus Harnoncourt is never one to adopt the conventional wisdom about anything. Sometimes his interpretations seem to radically rethink a piece in a wonderful way, but sometimes they seem odd just for the sake of being different. This Mass in b minor had some of both and some dubious justification to go along with it, but overall was an austere and transparent interpretation with a lot of beauty. The Harnoncourt pictured above was not to be seen, we got a more meditative type. Bach, Mass in b minor. Musikverein, 16/10/10. Conducted by Nikolaus Harnoncourt with the Concentus Musicus Wien, Arnold Schoenberg Chor, and soloists Genia Kühmeier and Elisabeth von Magnus, sopranos; Bernarda Fink, alto; Michael Schade, tenor; and Florian Boesch, bass-baritone. I’m not overly familiar with sacred music, so this is going to be brief. This performance used a 2010 Neue Bach Ausgabe edition that is reputedly improved (I’m not disputing that it is better, I just don’t know the details), and also celebrated the uncovering of Bach-Archiv Leipzig evidence that suggests Bach may have been writing the piece for, yep, Vienna. The operative part of this theory (besides “ooooo, Vienna!”) is that Bach did envision a performance of this work in his lifetime, contrary to many accounts that he was just writing it as a private magnum opus. Since it’s a Catholic missa longa, this would have to have been somewhere other than his Protestant Leipzig post. Previous theories have proposed he was writing it for Dresden or Berlin, so this isn’t a wholly new idea. But, you know, Vienna wants a claim on one of the few great composers with whom they don’t already have an obvious connection. If you wish to read more about this, you can do so in German in the Musikverein’s September/October magazine here. I think it’s kind of funny that he believes he still has to justify this decision as Bach’s intention. Particularly when we’re talking about a piece that, whatever the intention, never was performed during its composer’s lifetime and today remains somewhat hypothetical. 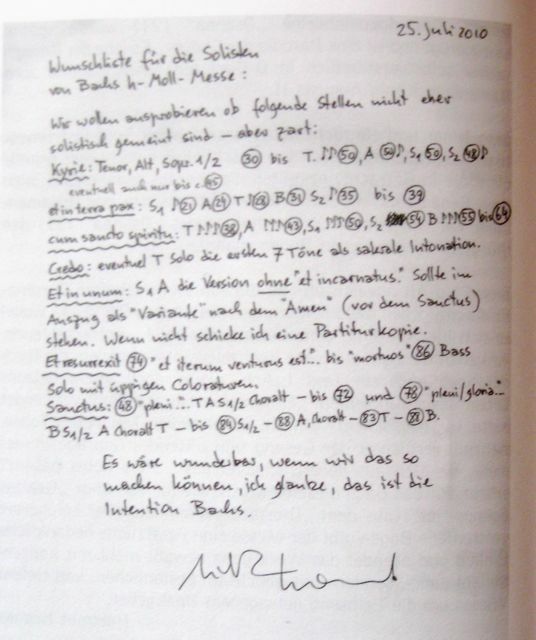 And we are presented with his handwritten note like a fragment of a manuscript; we should take it in trust that Harnoncourt has some open line of communication with Bach’s Intention. I’m open to new ways of performing anything, but to assert you know something that makes this a more “authentic” reading and then not offer any evidence is disingenuous. Also, in my opinion, unnecessary. If your version sounds better than it should justify itself. Truth is, the changes seemed relatively slight and I don’t have a strong enough view on this work to offer any kind of verdict. But there are your innovations, such that they are. So onto the performance itself. The Concentus Musicus Wien, here around 25 musicians strong, produces a silky, glassy sort of string sound, less grainy and aggressive than your more recently-founded period music groups. The brass are remarkably in tune and have that delightfully buzzy quality I love about HIP instruments. It’s lovely, but except for the trumpets it isn’t very loud, and was frequently overpowered by the approximately 50-member Arnold Schoenberg Chor, singing with precision and clarity. Harnoncourt’s interpretation seemed to take its cue from the Kyrie: funereal, stile-antico, static, intimate. Repeated details were emphasized: the precisely placed rising figure at the end of “eleison,” in the second Kyrie, the unequal eighth-note figures in the Laudamus te. The high point of the evening came in the majestic, solemn Credo’s Et incarnatus est and Crucifixus. Counterpoint never seemed thick or busy, everything sounded clearly. Even the most triumphant moments had a valedictory quality. The quintet of soloists was also fantastic. Bernarda Fink was the standout on the alto part with a highly expressive and communicative account of her arias that never seemed overly dramatic or fussy. In the two soprano duet, Genia Kühmeier’s vocal purity was an odd match for Elisabeth von Magnus’s darker sound, but both were excellent. (Von Magnus was replacing the ill Dorothea Röschmann. As soon as Kühmeier started I could tell she and Röschmann would have been a match made in vocal heaven, but oh well, von Magnus’s Laudamus te was appropriately intricate.) Michael Schade and Florian Boesch both sounded similarly outstanding on the male parts. I believe this performance is being recorded for CD, it’s not exactly your average imposingly grand Mass in b minor but is certainly worth a listen. Note: The premiere of Cardillac at the Staatsoper last night was a big success for all concerned. More here tonight. Well, "it’s not exactly your average imposingly grand Mass in b minor" THEREFORE "is certainly worth a listen". Right? Heard it on the radio, it was indeed superb.